This article is about an annual festival. 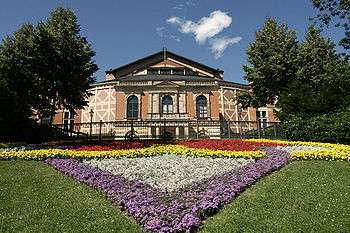 For the building used, see Bayreuth Festspielhaus. 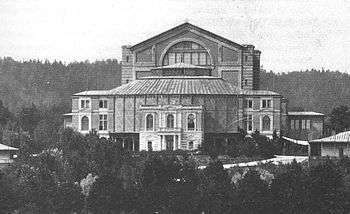 Since its opening in 1876, the Bayreuth Festival has been a socio-cultural phenomenon. The inauguration took place on 13 August 1876, with a performance of Das Rheingold. Present at this unique musical event were Kaiser Wilhelm, Dom Pedro II of Brazil, King Ludwig (who attended in secret, probably to avoid the Kaiser), and other members of the nobility, as well as the philosopher Friedrich Nietzsche who committed much effort to helping his then good friend Wagner establish the festival, and such accomplished composers as Anton Bruckner, Edvard Grieg, Pyotr Tchaikovsky, Franz Liszt, and the young Arthur Foote. Following Wagner's death, his widow Cosima continued running the festival at one or, more frequently, two-year intervals. She gradually introduced the remaining operas which complete the Bayreuth canon of Wagner's last ten completed operas. Levi, the son of a Jewish rabbi, remained the festival's principal conductor for the next two decades. Felix Mottl, who was involved with the festival from 1876 to 1901, conducted Tristan und Isolde there in 1886. Until the 1920s, performances were strictly in accordance with the traditions established under King Ludwig's patronage. Not a note was "cut" from any of the enormous scores; no concessions were made to the limits of human patience on the part of the audiences. Cosima Wagner preserved the productions of Parsifal and Der Ring des Nibelungen just as they had been in Wagner's day, defending any proposed changes with appeals to her son Siegfried: "Was this not how Papa did it in 1876?" The Festival authorities assiduously police the traffic of tickets, and monitor sites such as eBay. If the authorities suspect that a ticket has been resold without their consent (in practice, this means at a higher price than its face value), they may demand identification from the ticket holder on presentation and refuse entry to those who cannot prove to have purchased their tickets legitimately. In practice, this is uncommon. The newest production of the Ring (directed by Frank Castorf) premiered in 2013. Castorf's radical staging of the cycle—a colourful modern setting with the global race for oil as the underlying theme—was received with lengthy booing at its premiere. Tannhäuser (1978) Director: Götz Friedrich, Conductor: Sir Colin Davis, Soloists: Spas Wenkoff, Dame Gwyneth Jones, Bernd Weikl, Hans Sotin, Label: Deutsche Grammophon/Unitel. Historical performances of Wagner's operas at Bayreuth, available on CD, are too numerous to list. The following are a few outstanding examples. - from a radio broadcast of Deutscher Rundfunk; this is what German soldiers would have heard as "Guests of the Führer"
↑ Spotts, Frederic, Bayreuth: A History of the Wagner Festival, New Haven and London: Yale University Press, 1994. "The festival's archive, with its correspondence with Hitler and other documentation of the period, is still closed to research. He has not even been willing to have a modest memorial for the three Bayreuth singers who perished in concentration camps. 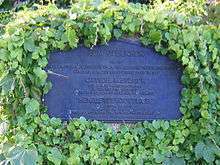 The proposal for a memorial plaque was proposed to Wolfgang ages ago by a retired singer and Bayreuth antiquarian bookseller, Peer Baedeker. And therein lies a revealing story. When the centenary festival opened in 1976 with a wreath-laying ceremony at Wagner's grave, Baedeker placed his own wreath with a ribbon attached, with the words: In memory of Richard Breitenfeld, Henriette Gottlieb, Ottilie Metzger-Lattermann Honoured as festival singers murdered in Nazi concentration camps. Within 24 hours of the ceremony, the ribbon had vanished. An article about the incident, which later appeared in an Israeli newspaper, was sent to Winifred, who wrote the following ineffable letter to Baedeker: Herr Heinrich Schaar in Munich sends me from time to time cuttings from the Israel Nachrichten, including this one. ... Herr Schaar appears to suspect that this was my doing or at my behest, since otherwise he would not have sent me the press cutting. In the first place I had no idea you had laid a wreath, and in the second I seldom go to RW's resting place; since it is now permanently open to the public, it is never possible to visit the grave alone. I myself never heard Frau Metzger-Lattermann in Bayreuth. but I know that my husband had a very high impression of her. Frau Gottlieb sang here in my time and I had a high opinion of her as well. Herr Breitenfeld is unknown to me. But were all three really killed at Auschwitz? I would doubt that in the case of Frau Lattermann, since she must have been terribly old. With best wishes, also to your wife, whom I recently greeted in front of Wahnfried." – The casualness of this brush-off, the brutal indifference to the murder of three old singers speaks volumes about the attitude in Bayreuth to its past. And so the monument that the festival visitor sees today on the Green Hill – the massive copy of the bust of a glowering Wagner made for Hitler by the Nazi sculptor Arno Breker – is, properly viewed, a brazen symbol of Bayreuth's (??)" ↑ Emmerich, Peter (1992). Wagner in Bayreuth: A Documentary. Belgium: Philips Classics Productions, Baarn. pp. 69–71. ↑ "Daughters chosen to run Bayreuth", BBC News, 1 September 2008. Retrieved on 1 September 2008. ↑ Hickley, Catherine (1 September 2008). "Wagner Sisters Katharina, Eva Named to Lead Bayreuth (Update2)". Bloomberg. Retrieved 1 September 2008. ↑ McGroarty, Patrick; Ron Blum (1 September 2008). "Bayreuth names Wagner half-sisters as co-directors". International Herald Tribune. Retrieved 1 September 2008. ↑ Roger Boyes, "Wagner hits a note of peace over Bayreuth", The Times (London), 2 September 2008. ↑ "Bayreuth Festival 2014". Bayreuther Festspiele. Retrieved 24 September 2013. ↑ "FAQ for humanities.music.composers.wagner". Retrieved 24 September 2013. ↑ "Götterdämmerung". The Economist. 20 June 2011. Retrieved 24 September 2013. ↑ "Was lange währt: Reform der Ticketvergabe in Bayreuth kommt voran" (in German). Klassik Magazine. Retrieved 24 September 2013. ↑ Tommasini, Anthony (1 August 2013). "At Bayreuth, Boos and Dropped Jaws". New York Times. Retrieved 14 August 2015. ↑ Kettle, Martin. Castorf has become the villain of the Bayreuth Ring cycle. Nietzsche, Friedrich, Twilight of the Idols, Penguin Books, 2003. Translator's Note (R.J. Hollingdale).